The US financial regulator has asked a New York judge to hold Tesla boss Elon Musk in contempt for violating a settlement over social media comments. The move by the Securities and Exchange Commission (SEC) comes after he tweeted about the car firm’s production. Last year, Mr Musk agreed that he would not make statements about Tesla’s financial performance without prior agreement with the company. That settlement followed his tweets in August about taking Tesla private. There was no immediate comment from either Tesla or Mr Musk on the SEC’s move. 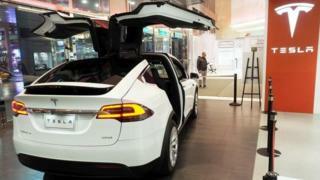 Tesla’s share price fell 5% in after-hours trading on Wall Street. Last week Mr Musk posted an aerial picture of thousands of new Tesla vehicles, and said that he expected the firm to make 500,000 cars in 2019. In court papers filed in New York on Monday, the SEC said Musk did not get approval before publishing the tweet which was inaccurate and in breach of Mr Musk’s agreement. The SEC noted that the tweet was disseminated to more than 24 million people. Tesla has endured a difficult period, following comments Mr Musk made on social media in August suggesting he had “funding secured” for a deal to take Tesla private. Its shares soared in response to those comments but weeks later Mr Musk backed away from the plan, after feedback from shareholders. US authorities ordered Tesla and Mr Musk to pay a $20m (£15.2m) fine. Mr Musk was also obliged to relinquish his role as chairman for three years. But he has remained defiant, while investors have also called for stronger oversight after his erratic behaviour attracted attention. In media interviews he said he often slept on a sofa in the Tesla office and in an online video he briefly smoked marijuana. Mr Musk said in an interview with news channel CBS that he has “no respect” for the SEC, but that he had chosen to pay the settlement fine because he believed in the justice system.